Leather is by most measures the trickiest material to sew. It’s thick, it’s tough, and it’s a needle-breaker like no other! It can burn out motors and snap gears in subpar sewing machines. So, if you’re planning to do any needlework with leather, this guide is for you! In it, we’ll introduce you to our favorite sewing machines for working with leather. We’ll tell you why we think they’re better than the competition and help you decide which to buy! Janome’s Magnolia lineup have been favorites of ours for years. They’re really superb sewing machines. They’ve been on the market for a number of years now, but their sturdiness and simplicity make them a competitive choice among the most modern options. We recommend the Magnolia 7318 to anyone who likes an all-manual machine. It’s well-equipped enough for all-purpose work, and sturdier than any of the less-expensive manual models out there. The key reason that these Magnolia’s have kept their popularity over the years is the build quality. While Janome still maintains a standard for construction that puts Brother and Singer to shame, none of their newer models can quite compare to these. The biggest difference between the Magnolia’s and the more recent Janome’s is the frame. The 7318 has a cast-iron frame inside, which is incredibly rugged. It provides fantastic rigidity, and lends lots of weight to the design. The Magnolia’s heft keeps it firmly planted on your work surface, and prevents jostles and shifts. Those could otherwise throw things out of alignment, or cause you to produce messy work. Likewise, its rigidity keeps things like tension and threading set properly, since even leathers can’t make the internal structure flex about. It’s well-equipped for an all-manual machine. The Magnolia 7318 has 18 stitches built in.They’re all marked out clearly on the face of the machine, and you can choose between them using a simple dial. You can adjust your stitch width and length via knobs on the machine. There’s a simple reverse lever to lock up your stitches, too. It’s also got a 4-step buttonhole feature. You might be tempted by one-step buttonholes on some other manual models, but the Magnolia’s makes itself worthwhile thanks to its balance-adjuster feature. It has a thread-cutter built in. The needle and foot can be lifted particularly high, which is ideal for bulkier materials like leather. The 7-point feed dog works as well as anything we’ve seen since this one came out. It adapts to different materials and thicknesses with no problem. The Magnolia also has a top-loading, jam-proof bobbin compartment that’s as convenient as any newer model to use. Tension is manual, which is an advantage if you know how to adjust it! With so many models these days–even the manual ones–tension is factory-set. If it goes wrong, you have to bring the machine to a service center to be adjusted. The Janome can easily be troubleshot and adjusted at home. It’s extremely neat and tidy, with very reliable performance. While user error can certainly produce errors and mishaps with this one, it performs extraordinarily well if you take care to read the manual before you use it. There’s a good reason people buy these even after years on the market! Even though it’s heavy-duty compared to most models in its price range, it’s still fairly portable. The 7318 is only around 12 pounds to carry. It’s covered by a 25-year warranty. These things have a reputation for lasting years with care. We think they’re a great investment, and a much better buy than cheaper models that you’ll have to replace in a hurry. It is an older model, and rather expensive. More recent models would give you things like one-step buttonholes, and automatic needle-threaders. We’re recommending the Magnolia 7318 as an all-manual model for its sturdiness and reliability on leather, not for its conveniences. It’s not perfect. One issue we’ve heard about with this one is loose belts from the factory. It only seems to be an issue with a small percentage of units, and isn’t something we’ve run into. Still, it’s something to check for when you get yours. If you like the sound of the Magnolia but know that you want some added features and conveniences, this 7330 model should be right up your alley. It has more onboard stitches, plus some helpful features like an automatic needle-threader. And it’s just as sturdy as the 7318! We think this is a good choice for someone who sews a wide range of projects, and wants an all-purpose workhorse that won’t choke up on leather. It’s the most affordable computerized model we recommend for leather and suede! It has a cast-iron frame and sturdy metal components, just like the 7318. The 7330 is part of the same Magnolia lineup, so it makes sense that it shares many of the same construction elements. Overall, it’s much heftier and sturdier than other computerized models–especially the cheaper ones. As with the 7318, the 7330’s rugged construction helps it stand up well to leather and other thicker materials–even in layers. It doesn’t flex out of alignment, and you don’t have to worry about any of the internal components going wrong (as long as you’re using a suitable needle and speed). You have a lot more options to choose from for your projects! The 7330 has about twice as many options as the 7318. It comes with 30 built-in stitches. The extra stitch options make this one a better all-purpose workstation, since you can work on more decorative, lightweight pieces as well as straightforward leather projects. The Magnolia 7330 also makes buttonholes a lot more fun. While we like the 4-step feature on the 7318 well enough, the 7330 has one-step buttonholing. It also gives you more options for styles! There are 6 different buttonhole styles onboard. All of them work with a handy sensor attachment to resize to the specific button you’re using. Selecting stitches is super easy, via the simple up and down keys. There’s also a mode button next to those keys. It scrolls through stitch selection, stitch length, and stitch width. You adjust all three via the same keys. It’s all very neat and tidy, which is one of the reasons we actually prefer the 7330 over a lot of more recent computerized models. It has a double-lift presser foot and extra-high positioning options, just like the 7318. Again, those little design tweaks make handling thick materials like leather much easier. One great feature that you can’t get on a manual model is programmed needle positions. The Magnolia 7330 lets you set your own in the computer, so that the machine will memorize where you want the needle to land when it stops. Depending on the leather projects you do, that can be incredibly handy. Even though it’s a computerized machine, it has manual tension adjustment. When you work with tougher materials like leather on a regular basis, you want to be able to fix tension yourself. Having a factory-set machine is a nightmare to deal with, which is one key reason why we’ve avoided Brother’s popular computerized models for this guide. On the Janome’s we’ve chosen, you can always straighten things out yourself without an expensive trip to the service center. The 7330 also adds some extra stitch controls that you don’t get on the 7318. It has a stop-start button right on the machine’s front panel, so you can work without the foot pedal. There’s also a sliding speed control. You can use the slider to set a top speed limit for the foot pedal, or to set a constant speed when you’re using the button to stop and start. Speed limiting is a great feature for working with leather, but it’ll also come in handy for your other projects! Unlike the 7318, the 7330 has an automatic needle-threader onboard! It’s simple and easy to use. This model also has a more modern drop-in bobbin compartment that’s easier to use and less likely to jam. You can drop the feed dogs or use the free arm to do trickier projects or free-motion sewing. In addition to the reverse button that’s included on both the 7318 and 7330, the 7330 sports a locking stitch button. It makes your life much easier when you’re finishing a stitch, and it’s a nice convenience feature to have onboard. It’s covered by a 25-year warranty, and backed by an excellent reputation for reliability. Although it’s computerized and offers lots of conveniences, it has relatively few stitches built in. It’s also quite expensive given the amount of features it has. Many more recent models give you twice the stitches or more, for less money. We’re recommending this one for its build-quality and reliability rather than its stitch variety. In any case, you’ll have more to work with than you would on a manual model like the 7318. 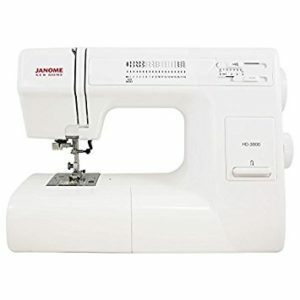 If you’re looking for an all-purpose computerized sewing machine for leather, but want more features and stitches than you get on the Janome Magnolia 7330, have a look at the Janome DC5100. It’s as sturdy as the Magnolia’s, but adds a heck of a lot more versatility. The DC5100 has all the automatic conveniences you want in a modern sewing machine. It’s fully-computerized, with an ample bank of stitches and lots of room for customization. We think it’s the best all-purpose sewing machine for most needleworkers to use for leather. As with the Magnolia’s, the DC5100 has a metal frame inside, and mainly metal components for durability. It’s quiet, sturdy, and powerful. This is the most powerful of the three, and it doesn’t have any qualms about handling leather. It adjusts to different thicknesses easily, thanks to the same 7-piece feed dog as the Magnolia 7330. The DC5100 also has fantastic automatic tensioning, which takes a lot of the tweaks off your shoulders as you work. Unlike so many other computerized models, it actually works perfectly. You can always override it if necessary, too. This one has a backup knob. The DC5100 has a sliding speed control like the Magnolia 7330. You can use it to limit your speed when you’re using the pedal, or to set a constant speed if you don’t want to use the pedal. It has the same stop/start button, as well as a reversing button. There’s also the same locking stitch button that you get on the 7330. It has far more stitch options than you get on the Magnolia’s. There are 167 in all. That’s more than most of us ever use in practice, even though there are certainly machines with 4 or 5x as many. They’re all diagrammed on a fold-out chart that’s built into the top of the machine’s housing. We really like this feature, because it gives you a convenient way to see all your options without digging out the manual or scrolling through menus. It folds easily back in place when you’re done browsing. The keypad makes all the stitches much easier to get to than dialing in each digit with the +/- buttons on the 7330. The overall computer setup is much quicker to navigate than the Magnolia’s, too. The DC5100 has dedicated buttons for increasing/decreasing stitch length and width. The larger screen allows it to show you better troubleshooting info. The computer will also suggest the appropriate foot to use for any stitch you select. The DC5100 has a full monogramming alphabet and number set, as well as the stitch options! You can adjust the size of the font, too. There’s also a set of 5 different one-step buttonholes. That’s actually one less than the Magnolia 7330, but you won’t miss the extra option. Most of us only use 3 or 4 in practice. You can use the 50 available memory banks to save your own patterns and preferred settings! That’s perfect for more experienced sewists who want to achieve a signature look. You can set your preferences and easily come back to them every time you create a piece! It not only has a convenient top-loading bobbin–it can wind bobbins automatically! While the incandescent bulb is a bit old fashioned for something this sophisticated, it’s very bright. It’s all very easy to learn. The manual is clear, thorough and helpful. The DC5100 is definitely too expensive to recommend to most new needleworkers, but it makes it easy for anybody to get to know the machine, since it does have its own particular features. At the same time, it has so many features that it’s not something most people will outgrow quickly, if ever! Unless you’re a daily crafter or a professional, this is probably as much as you need to spend on a sewing machine–even for leather. Right out of the box, that makes for a vastly more versatile machine than either of our other recommendations. You’re not likely to use all those feet for leather, but the straight stitch foot is certainly a boon for that material! It’s covered by a 25-year warranty. While this one’s been on the market for a lot shorter time than the Magnolia’s, it’s already earned a reputation as an extremely reliable machine. We haven’t come across any reliability or durability issues with the DC5100. You’ll probably want to replace the incandescent bulb at some point, since it won’t last as long as an LED. While the DC5100 has a metal frame, it’s not quite as hefty as the Magnolia’s. That’s because Janome have started using aluminum frames to save weight. They’re nearly as good, but they do make for a slightly less rock-solid feel. Still, we haven’t run into problems with the DC5100 wobbling or coming out of alignment. It’s pricey for the casual user. This is something we recommend to people who sew every week or every day. We think this is one of the most capable all-purpose sewing machines you can find for leather. It’s the absolute best you can find for less than $1500 or so. If you want something even better, have a look at our Ultimate recommendation on our homepage. Which of our recommendations should you buy? 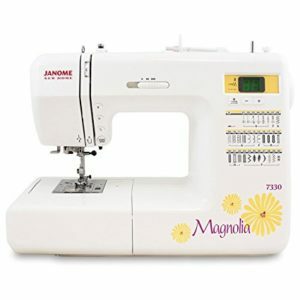 The Janome Magnolia 7318 is by far the most affordable, so it’s our shoo-in choice for working with leather on a budget. It’s sturdy, simple, and powerful enough to tackle any general leathers. You probably won’t need any more features than this offers for your leather projects. However, if you want more variety for your other needlework, you may want to spend a bit more for one of our computerized recommendations. The Janome Magnolia 7330 is our midrange pick. It’s priced squarely in the middle of our other two recommendations, and gives you a good compromise between their features. It has the Magnolia 7318’s cast iron frame, but adds a taste of the versatility and convenience that you get with the DC5100. It’s good for any typical leather work you might have in mind, as well as other projects. The downside is that it’s expensive for the amount of programmed features that you get. If you want something with a wider range, go for the DC5100. 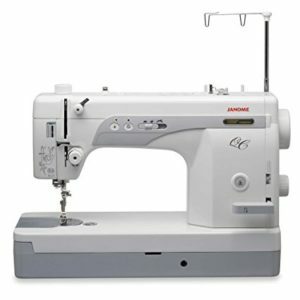 If you’re a passionate needleworker who wants a full-featured sewing machine that’s sturdy enough for leathers, go for the DC5100. It has by far the most features and conveniences of the three, and comes with a big set of accessories out of the box. It’s not quite as heavy as the other two in terms of its frame, but it’s still mostly metal and sturdier than other computerized models. This one does a great job on tough, thick materials, and has the finesse to give you professional results on anything you want to sew. Just plan to spend at least $600 for it! 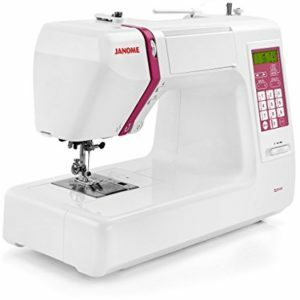 you’ve probably noticed by now that we’ve recommended only Janome sewing machines for this guide. That’s because they’re by far the best brand in terms of build quality that we’ve come across. We love Brother’s for fancier things like embroidery, but when it comes to workhorses, you really want a Janome. Since leather is the biggest test of power, sturdiness, and build quality you can find, we think Janome’s are the best choices for dealing with it. Juki’s are also a good choice, but they’re so expensive that we think they’re prohibitively expensive for most buyers. If you want to look at one that would be suitable for leather, check out the HZL-F600 on our homepage! Be warned in advance that it’ll cost you $1000+, though. For our main recommendations in this guide, we’ve focused on all-purpose sewing machines. That’s what most buyers are looking for. However, if you’re a professional who works with leather materials on a daily basis, and don’t need anything fancy, a straight-stitch machine is often the best way to go. These machines are generally more expensive than all-purpose models, even though they have fewer features. That’s because they’re built industrially. The 1600P-QC is a phenomenal straight-stitch machine that’s ideal for any pro craftspeople who work with leather. It can sew as fast as 1600 stitches per minute, but it can also be turned down as slow as 800. It has an industrial rotary hook, variable speed control, and options for you to set memorized needle positions. We like it for leather because it has an extra-large work area, and cuts threads automatically. It has enough power to go through any leather like butter, even over seams and layered pieces. This one has earned a place as a favorite among professionals, and it’s easy to see why! The HD3000 is a favorite sewing machine of ours, and it was hard to leave it out of our top three leather picks. We did so because it’s rather expensive for what you get, and most people don’t need this level of build quality. If you place a premium on power and construction quality, though, it’s hard to argue with the HD3000’s appeal. This is a sturdy machine by any measure. It has an all-metal frame, and aluminum casing. That’s a one-up on any of our picks for this guide! It has a similar range of versatility to the Magnolia 7318, but costs ~$150 more. We mention this for people who work with leather very frequently, and need something that can handle the strain of professional work. It gives you more options than the 1600P-QC above, but doesn’t cut any corners in terms of construction. Just be aware that it’s an all-manual machine, with very few amenities. The most important thing to look for on a sewing machine for leather is build quality. The sturdier your machine is, the better it will handle heavier, thicker materials like leather. If you have a lightweight, delicate machine, sewing leather will knock things out of alignment or break a component in no time. So, look for as many metal parts as possible. You should expect a metal frame at minimum, and as many metal innards (gears, etc.) as you can find. The goal is to get something as sturdy and rigid as possible to prevent flexing or cracking. Quite simply, sewing leather successfully requires a lot of power. Power doesn’t necessarily mean speed, though. When you’re looking at sewing through tough materials, it actually means torque. However, torque isn’t listed as a spec on sewing machines. So, using speed specs as a way to judge the power of a given machine can be a good way to eyeball. Remember, while you won’t be using the top speed setting, faster machines do generally have more powerful motors backing them up. So, they won’t have to strain as hard to get through thicker materials at lower speeds. Finally, make sure you think about the specific kind of work you do with leather. Do you sew many layers? With what kinds of stitches? Specialty threads? Thinking about everything you want to do with your sewing machine up front is absolutely essential. Likewise, if you’re looking to buy an all-purpose machine that will handle your other tasks, keep in mind the features you’ll need for those other applications. If you’re not going to be doing more than straight stitches and free-motion sewing, you might consider getting a straight-stitch machine. Having a good machine is very important for sewing leather. It’s not everything, though! No matter what machine you use, you need to know how to use it properly. You should never try and stitch through leather without using a dedicated leather foot. 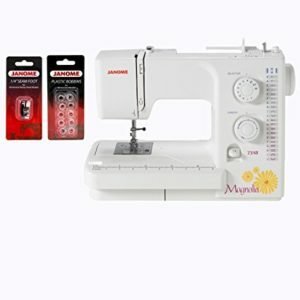 They’re not usually included with standard sewing machines, so be sure to grab one that’s designed to fit your new machine. If one of these recommendations seems like a good choice for your leather projects, go ahead and click on the links in its review! That’s the easiest way to see more features and specs, as well as current prices. If you’re not sure whether one of these machines really suits your needs, we suggest having a look at our home page. There, you’ll find our overall favorite machines. Many of them are good for leather as well, something we’ve been sure to mention in our reviews!